Most people realize, when they’re watching a dramatic work based on some historical event, that they’re not getting a history lesson. And by this point, I think it’s dawned on most viewers of The History Channel that their chances of seeing historically edifying programming on that network are comparable to their chances of seeing a beluga whale while vacationing in Montana. Why, then, is the total disregard for accuracy in Sons of Liberty such a big deal? It’s a big deal because a heck of a lot of people who watched Sons of Liberty while under the impression that they were having an educational experience. This is not my assumption. This is a fact. I know this is the case because I was scrolling along on Twitter while I watched the miniseries, looking at tweets with the #SonsOfLiberty hashtag. I saw a lot of tweets decrying the show’s misrepresentations, but I saw as many if not more tweets from people who were totally psyched about how much they were “learning,” about how they wished schools would screen the whole thing for students, about how they were getting more information out of the miniseries than they ever did in their history classes, and so on. Actually, when I first wrote this post, I’d embedded a few dozen of these tweets to prove how pervasive this sense of the series as an educational experience really was. Since it occurred to me that your average Twitter user probably doesn’t want some blogger to cite him as an example of somebody who mistakes entertainment for edification, however, I decided to leave them out. So if you want to get a sense of what I’m talking about, just search Twitter for #SonsOfLiberty and the word “learning” or “school” and you’ll find plenty of examples. SONS OF LIBERTY is a dramatic interpretation of events that sparked a revolution. It is historical fiction, not a documentary. The goal of our miniseries is to capture the spirit of the time, convey the personalities of the main characters, and focus on real events that have shaped our past. For historical information about the Sons of Liberty and the dawning of the American Revolution, please read the Historian’s View section on history.com/sons. I’m glad for the statement the series is “historical fiction,” but the rest of the disclaimer’s language obscures more than it clarifies. The series doesn’t “capture the spirit of the time” when it fundamentally misrepresents the nature of British authority in the period leading up to the war. It doesn’t “convey the personalities of the main characters” when it depicts Hancock as a reluctant dweeb, Gage as a sadistic tyrant, and Sam Adams as a brooding young heartthrob. And it certainly doesn’t “focus on real events that have shaped our past” when the sequences portraying these iconic events—the destruction of Hutchinson’s house, the Boston Tea Party, Revere’s ride, the firefight at Concord, and the Battle of Bunker Hill—bear little relation to what actually happened. In fact, of all the iconic “high points” that figure in the series, I can’t think of a single one depicted accurately enough to be suitable for use even as a visual aid in a classroom. Some historical films take liberties with chronology and characters, but at least have the virtue of providing a compelling and reasonably useful enactment of particular events. I’m thinking of the siege of Ft. William Henry in Last of the Mohicans, the O.K. Corral shootout in Kasdan’s Wyatt Earp, and the final attack sequence in Glory. But what point would there be in showing your students Sons of Liberty‘s take on Lexington Green when the whole thing seemingly takes place in a field in the middle of nowhere, with British officers torturing and executing wounded minutemen? Or screening Paul Revere’s capture when he takes on a whole group of redcoats who have him at gunpoint, like Chuck Norris in a tricorn hat? Or the Boston Tea Party scene, with Whigs decked out in Lord-of-the-Rings-style orc war paint? If anything, the short notices aired during commercial breaks, in which The History Channel reminded viewers to log on to the show’s website for the facts behind the story, might have made the whole thing worse. Viewers who visited the site might have gotten some useful information, but for the many who didn’t, the mini-commercials for the website only lent the whole thing an air of credibility it didn’t have. Hey, if there’s a companion website with commentary from historical pundits, the show must be pretty legit, right? Perhaps the liberties taken with the material wouldn’t trouble me so much if the show ran with a disclaimer at the top of every hour, reminding viewers that what they were seeing was fictionalized and only loosely based on real events and people. In any case, the fact that so many Twitter users took the show as a learning experience indicates that The History Channel still carries an air of authority and authenticity, whether the network’s brass want it or not. Since that’s the case, they really need to approach their (increasingly rare) historical programming more seriously. If you want to be nothing but another TV network, fine. But don’t pretend to be anything else. Here’s how The History Channel describes their new miniseries: “SONS OF LIBERTY is a dramatic interpretation of events that sparked a revolution. It is historical fiction, not a documentary.” That’s quite an understatement. It’s like calling Godzilla a reptile of above-average stature. 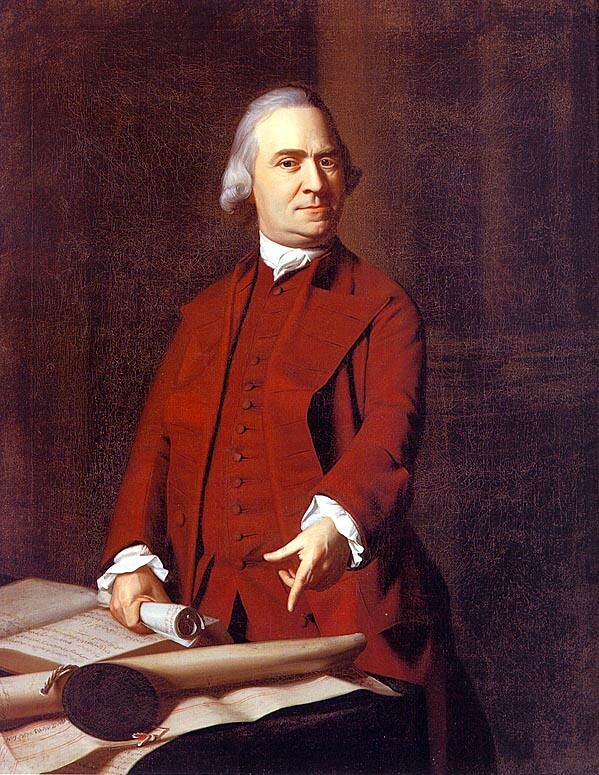 I knew I was in for a doozy from the very start of last night’s first installment, when Samuel Adams escaped from a party of redcoats by bounding parkour-style across Boston’s rooftops. No wonder they made him twenty years younger and thirty pounds lighter than his historical counterpart. Can’t have the main character keeling over from cardiac arrest during a big chase sequence. Hey, if video games have taught us anything, it’s that the eighteenth century was all about aerial stunts. The History Channel claims that one of the show’s aims is to “convey the personalities of the main characters.” If that’s true, they might want to head back to the drawing board. The two main protagonists, Sam Adams and John Hancock, share little in common with the historical figures other than their names. J.L. Bell has weighed in on the problems with Adams’ depiction at his blog. As for Hancock, the miniseries portrays him as a dandy who’s quite uncomfortable walking into a tavern full of toughs. The real Hancock was indeed a stupendously wealthy man, certainly no stranger to fine clothes, lavish parties, and good wine. But he was also a man who, when informed that British regulars were en route to Lexington, brandished his gun and sword and swore up and down that he “would never turn my back on these troops.” It took the entreaties of Sam Adams and Paul Revere to convince him to escape. It was instructive—and a little depressing—to follow the Twitter hashtag #SonsOfLiberty during the premiere. Most of the tweets I saw were pretty positive about the show. There were plenty of remarks about how modern politicians could learn a thing or two by watching real ‘Murican patriots on TV. I found these sentiments highly ironic, since the larger political issues surrounding the onset of the Revolution were actually absent from the first episode. Instead, the miniseries emphasizes the personal aspects of the Whigs’ involvement. Adams and Hancock aren’t motivated by abstract notions of rights and liberties. They’ve got a beef with Hutchinson (promoted to governor in the first episode) over his meddling in their financial activities. When the mob attacks Hutchinson’s house, they do so because he’s persecuting Adams, not because of the Stamp Act. The premiere basically has the whole Revolution boiling down to a bunch of personal grudges. Personal conflicts certainly played a role in the Revolution, but the show de-emphasizes principles to such an extent that I can’t fathom why so many back-to-the-founding folks tweeted enthusiastically about it. Many tweets ran something like this: “Psyched about #SonsOfLiberty bc I’m such a total history nerd LOL!! !1!11!” I hate to break it to you, kiddo, but if you were a “total history nerd,” you wouldn’t be so psyched about two hours of pure fiction. You’d be reading Pauline Maier. You could fill pages on the show’s historical discrepancies, both major and minor. The chronology is hopelessly mangled. John Adams’ house looks nothing like the real thing, nor does it bear any resemblance to any intact eighteenth-century home I’ve ever seen. There’s far too much facial hair for the late 1700s. Gen. Gage was already in America during the events depicted in the series. You get the idea. For a detailed breakdown, check out Thomas Verenna’s episode-by-episode critique. I think the only thing the first installment really got right was the sense of tension and volatility in Revolutionary-era Boston, a place where the streets roiled with passion and violence, where officials were sitting on top of a volcano that could erupt in revolt at any minute. If I disliked the first episode so much, I’ll be skipping the other two, right? Yeah, I would…except I’ve always wanted to see Lexington and Concord on film. It’s the prospect of a few well-executed battle sequences that will bring me back to the TV, in spite of my better judgment. No doubt I’ll be disappointed, but not as disappointed as all those gals who watched the premiere will be when they do a Google Image search for Samuel Adams. That seems to be the gist of it, anyway. Sort of like if you combined Zorro with The Fugitive in 1770s Philadelphia, with some proselytizing thrown in. The leading mercenary for the British East India Company, Will Reynolds has just been double-crossed and now is on the run in the American Colonies. Working to redeem his name and win back the affections of the woman with whom he’s never been fully truthful, Will now hides behind a new mask in hopes of thwarting his former employer. As his past life closes in on him, Will must somehow gain the trust and the help of his beloved Charlotte – as well as Ben Franklin – while he races against time to defuse a plot of historical proportions. Coming to theaters Spring, 2015, Beyond the Mask is a revolutionary new family film that brings history to life in a faith-filled adventure celebrating grace, liberty, and the true freedom that can only be found in Christ. Two hundred years after the Battle of New Orleans was waged — earning it an eternal place in Louisiana history books and further burnishing Andrew Jackson’s reputation as one of America’s original action heroes — it is getting the Hollywood treatment. In a ceremony timed to coincide with local bicentennial celebrations of the historic skirmish between American and British troops, fought in January 1814 as one of the closing salvos of the War of 1812, Hollywood producer Ken Atchity and brother Fred unveiled plans Friday (Jan. 9) for a major feature film about the battle’s place in history and Jackson’s role in it. With a planned budget of $60 million to $65 million, the independently financed “Andrew Jackson and the Battle for New Orleans” is being targeted for a possible 2016 release, with shooting to begin as early as this summer. Envisioned by Ken Atchity as a sweeping action epic in the vein of 2000’s “The Patriot” and 1995’s Oscar-winning “Braveheart,” the film will be shot entirely within a 30-mile radius of New Orleans, he said. I’m really excited to see this happening, but as I’ve said before, what I’d really like to see is a sprawling, three-hour, Patton-esque Old Hickory biopic. I’d start with a brief scene at the American lines on Jan. 8, 1815, zoom in on Jackson’s face as he scans the horizon for signs of the British, and then flashback to his boyhood injury at the hands of a redcoat officer during the Revolution. Flash forward to the Dickinson duel and the run-up to the War of 1812, cover his Creek campaign, then New Orleans for the big climax. Time permitting, I’d include the whole 1818 Florida imbroglio, and then cut to James Monroe and John Quincy Adams mulling it over and discussing the fact that the country hasn’t heard the last of Jackson…annnnd roll credits over some rousing military music. Here’s an earlier Hollywood take on Jackson in New Orleans, with Charlton Heston as Old Hickory and Yul Brynner as Jean Lafitte in The Buccaneer (1958). Heston was probably used to filling Jackson’s boots at that point, since he’d played the same role in The President’s Lady just a few years earlier. When is “early America,” anyway? This semester I’m taking a course on early America and the Atlantic. A lot of our reading deals with expanding the physical boundaries of what we think of as “early America,” incorporating insights from scholars working on Latin America, the Caribbean, and the connections between the Americas, Europe, and Africa. Last week we spent some time discussing temporal boundaries along with physical ones. When exactly was early America? If we’re using a chronological term to describe an area of study, shouldn’t there be a better notion of what constitutes the period under discussion? Columbus seems like a logical starting point, but coming up with an end date is a lot trickier, and your choice of a terminus will reveal a lot about your historical priorities. If you decide to cut things off at 1776, 1783, or 1789, you’re privileging politics over markers of culture, religion, and other factors that remained much more constant after those dates. You’re also more or less saying that U.S. history is the only early American history that really matters. What if we set our end point at the date when Latin America became independent? That privileges politics, too. And there’s a sense in which a cutoff point in the early 1800s makes even less sense than 1783 or 1789. In many ways, the social, technological, and economic atmosphere of the 1820s looks more similar to the mid-nineteenth century than it does to the late eighteenth. We could arbitrarily pick a nice, round year, like 1800, but the fact that it’s a nice, round number is just about the only thing it’s got going for it. Does the question of early America’s chronological boundaries matter? I think it does, because the way we create these containers for particular fields of study inevitably shapes the questions we ask about the past and the places we go to find answers. On a more practical level, it also determines who goes to which conferences, who gets hired for particular positions, and so on. These chronological boundaries might be artificial, but their effects on the way we conceptualize the past are very real indeed. Driftwood got a recording contract about twenty years later, but “The Battle of New Orleans” didn’t become a sensation until Johnny Horton heard it on the radio while driving home from a show and decided to do his own version. Horton got a hit, Driftwood got a second career as a musician, and we got a song so awesome it almost makes up for the White House getting torched. Selma and LBJ: Do filmmakers owe anything to historical figures? There’s been an interesting discussion among historians and movie critics about the movie Selma, which plays up the antagonism between Lyndon Johnson and Martin Luther King, Jr.
Why does the film’s mischaracterization matter? Because at a time when racial tension is once again high, from Ferguson to Brooklyn, it does no good to bastardize one of the most hallowed chapters in the Civil Rights Movement by suggesting that the President himself stood in the way of progress. LBJ’s bold position on voting rights stands as an example of what is possible when America’s leadership is at its best. Selma doesn’t just portray LBJ as dragging his feet on civil rights. It makes him complicit in the FBI’s attempt to silence King by blackmailing him with evidence of his extramarital affairs. Others claim that LBJ’s defenders have overstated their case by attributing the march to Johnson himself, as if he came up with the whole idea. This certainly isn’t the first time filmmakers have taken historical liberties—far from it—but it’s a particularly interesting case. It portrays a prominent individual as standing further to the wrong side of history than he did, and deprives him of credit for contributing to equality and moral progress. So leaving aside for the moment the well-worn question of whether filmmakers have a moral obligation to be as historically accurate as possible, do they have a more specific moral obligation to avoid portraying historical figures as acting less nobly or honorably than they actually did? And does the fact that Selma deals with very recent history make this obligation greater? I haven’t seen the film yet (although I plan to), and twentieth-century history isn’t really my thing, so I’m hesitant to weigh in. What do you folks think?